Better, I think, to watch Dinner with Goebbels than to actually have dinner with the Nazi Minister of Propaganda. What about dinner with Karl Rove, the creator of the War on Terror? Or Edward Bernays, Sigmund Freud’s nephew, know as the father of public relations? You can see the three of them in an imagined dinner in The Estelle Craig ACT II STUDIO‘s production at Aki Studio. This is the fourth time the play has been produced since its debut in 2012. Given the current political situation worldwide, particularly in the US, it may be more timely now than it was when it when it was originally presented: playwright Mark Leith uses the Goebbels character’s blind dedication to the Nazi party and the Rove character’s blind dedication to the Republican party to draw a straight line connecting the two. For the most part, the conversation between the three men over dinner seemed natural enough, but then there were times when it seemed as if Leith wanted to really underline the seriousness of the point and the language became quite formal, almost stilted. I found the shift a bit distracting. When it comes to the performances, The Estelle Craig ACT II STUDIO is part of The G. Raymond Chang School of Continuing Education’s Programs for 50+ at Ryerson University. 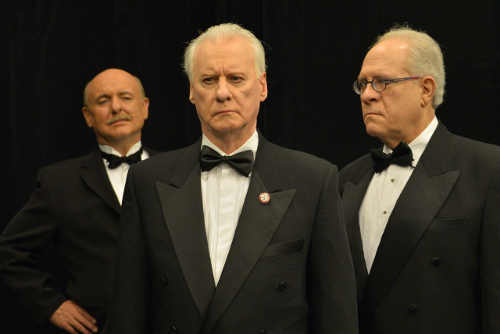 It’s so nice to see older actors looking their age on the stage. Randal Moore’s Bernays was paternal, a proud father watching over his sons as they each vie for first place in his heart and mind. He watched fondly as Goebbels (Kevin McLellan) and Rove (Saul Kaufman) criticized each other and built up their own accomplishments to win his favour, intervening once in a while to keep things civilized, but remaining detached from the competition. Kaufman’s Rove couldn’t have been anything but American: a slight swagger, a bit larger than life, and not really listening to anyone else. McLellan’s Goebbels, on the other hand, was physically contained and very intense, and had a great German accent. (Yes, I do realize that these are stereotypes). With fine performances, the play should have worked. But it really didn’t. At least, not for me. The timing seemed off. The pace was uneven, sometimes slow and sometimes fast in ways that didn’t seem to fit what was happening. As with any profession, it’s tough to relax into your job when you’re new at it. When you have three inexperienced actor on stage and someone forgets their line, the others tend to freeze rather than being able to cover and carry on. There were quite a few forgotten lines in Wednesday evening’s performance. It interrupted the flow and threw off the timing. Maybe more rehearsal time would help. The show is only 60 minutes long, and there’s a 30 minute talk back after each performance. At that length, I’m glad I saw the play. It’s an interesting concept and the actors did a fine job with the characters.